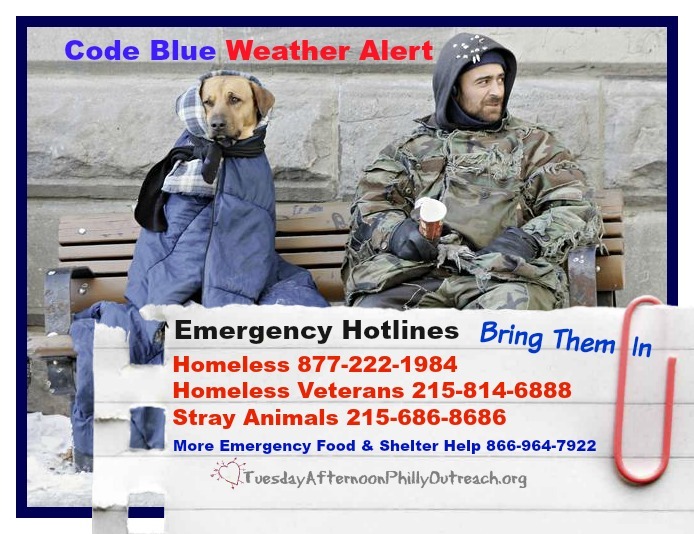 Extreme bitter cold in Philly with more snow on the way – Code Blue weather with close to 6000 homeless on the streets. Call 215-232-1984 if you see someone outside in need of help – many emergency emergency shelters have been open and transportation is available. In Bucks County the Homeless Hotline is 215-550-3578 staffed by the Bucks County Coalition to Shelter & Support the Homeless. Transportation is available and shelter locations listed on their website: co2ssh.org. UESF Vet Outreach provides immediate assistance to veterans that are homeless or struggling to survive. Call the Vet Hotline at 215-814-6888 if you know of someone who served and is in need of help. A new Philadelphia ordinance calls for fines of up to $500 for pet owners who leave their pets out in extreme cold. If you see an animal out in the cold call the Philly ACCT Hotline at 267-385-3800. In this frigid weather it’s important to feed the critters outside, water too. Tuesday Afternoon Philly Outreach has emergency coats, warm clothing and food for anyone in need. Volunteers are welcome to help with transportation and distribution. TAPO can be contacted by email at tuesdayafternoon.outreach@yahoo.com. Stay safe inside and remember to check on the elderly and disabled. We’re in this together, no one is home until we’re all home. March 5th – largest snowstorm of the year and Code Blue Weather. Emergency Numbers you need to know. Bring pets in, and feed the critters outside, water too.